It was back to Parliament for the PM and MPs after recess. 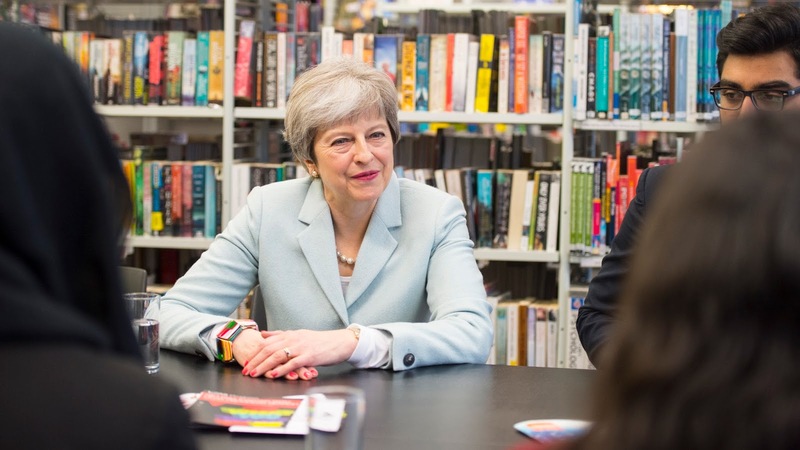 Starting the week announcing a review into post-18 education, the PM visited Featherstone High School in Southall before travelling to Derby College. May was also interviewed on This Morning, picking her icy blue blazer, black trousers and the leopard Delicious flats from Russell & Bromley for the day. 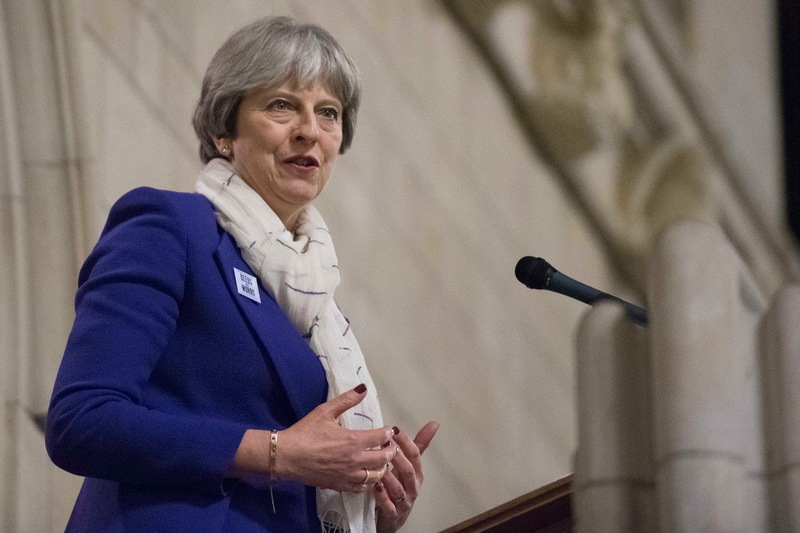 On Wednesday, Theresa May headed to the Commons for Prime Minister's Questions. 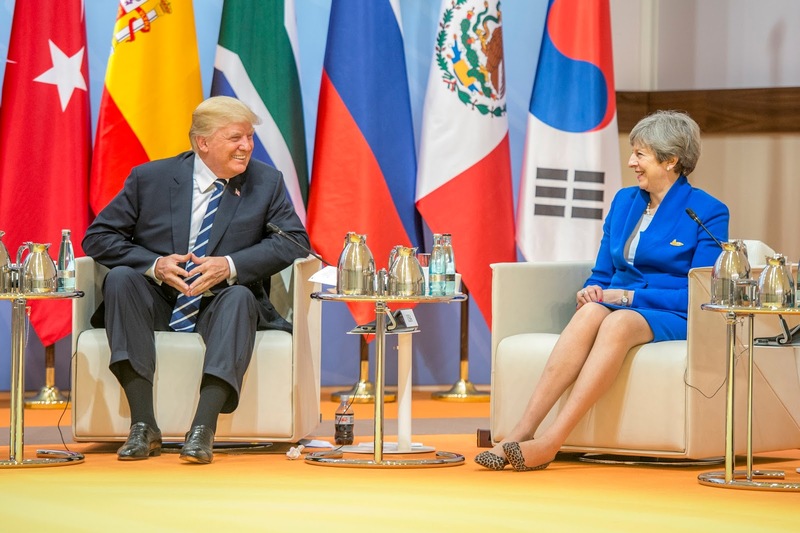 The great tailored navy Escada skirt suit made a reappearance, with the PM teaming it with a white cami, green oversized jewelled necklace and the red Link In block heels from Russell & Bromley. 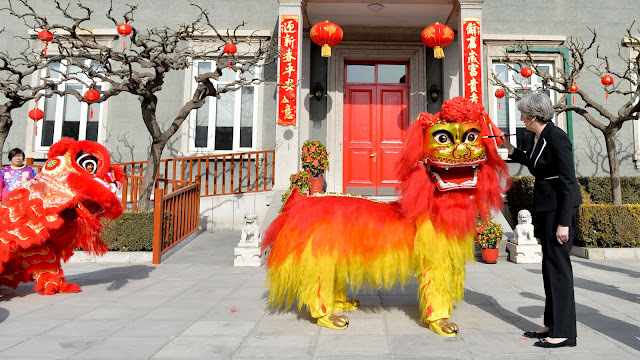 The latter was perhaps a subtle nod to the Chinese New Year celebrations that took place at Downing Street in the evening. 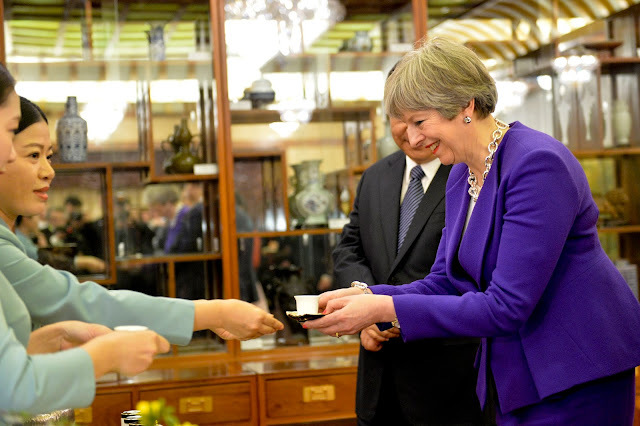 May also welcomed the PM of the Netherlands to Number 10. 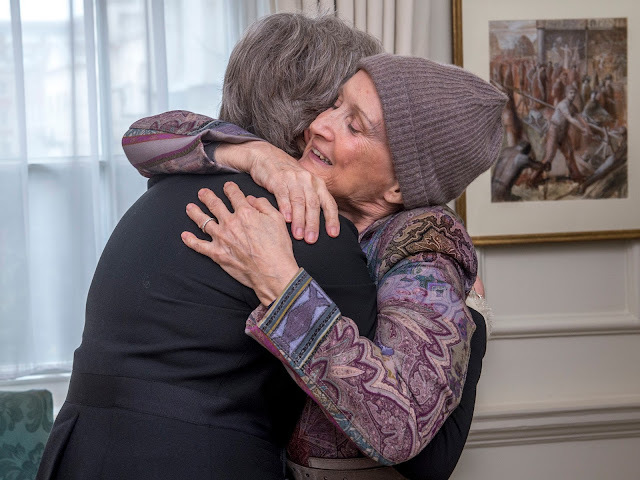 On Thursday, before heading to Chequers for a Brexit meeting, the PM welcomed Baroness Tessa Jowell to Number 10 to discuss further funding for brain cancer care and a £45million boost to brain tumour research. 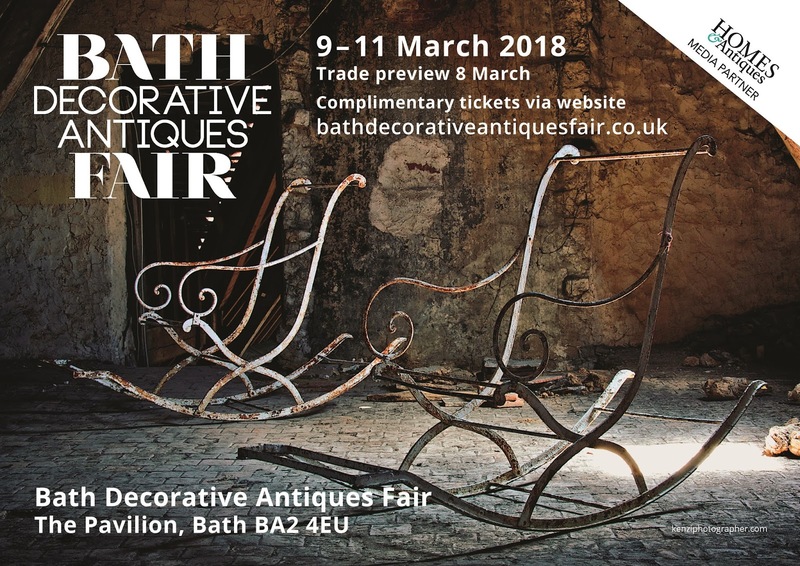 It's almost time for the Bath Decorative Antiques Fair- the highlight of the spring season! furniture will rub shoulders with decorative staples of the 80s and 90s now back in demand by a new and younger audience – French marble top chocolatiers’ tables, elaborate brass and steel bakers’ racks, buffets and armoires in fruitwood, huge pine refectory tables and Windsor chairs, rows of yellow confit pots, pub signs, marine and advertising ephemera, homely Staffordshire dogs, samplers and quilts and yes, large scale oak, mahogany and walnut brown furniture re-imagined by a new generation of decorators and collectors. New for 2018 will be King George Antiques, Kent who specialises in library furniture and Country House pieces with the majority of the exhibitors being returnees year on year including Erna Hiscock & John Shepherd, Kent, Cherrie & Michael Todd, Somerset, Terry and Marie Kelly, Somerset and Appledore Antiques, Devon all of whom specialise in naïve country furniture, Folk Art, samplers and early pottery. From farther afield come The Archives from Belgium with decorative furniture and unusual accessories and glass, Bohm’s Antiek from Sweden with painted Swedish provincial furniture and Mark Blower Antiques, Channel Islands, with period portraits, colonial antique furniture and accessories. chairs and sofas for which the company is known. The fair takes place at the very beginning of Spring and visitors will be delighted to see Linda North, Hertfordshire, who’s stand will be heavily laden, bursting with urns, jardinieres, wirework garden furniture, statuary and objects. 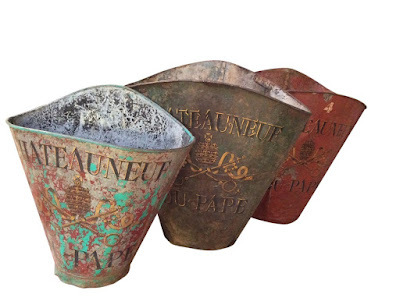 Linda Townshend Bateson, Tetbury, will also show a wide range of antiques for the garden. Returning after a successful debut in 2017 will be Joe Chaffer of Vagabond Antiques, Petworth who deals in an expertly curated mix of Old World Country House pieces with decorative antiques for the garden. Large scale shop counters, dressers and antiques for the garden will be showcased by Kent dealers Elham Antiques. A northern contingent will be descending on Bath this year with Molly & Maud’s Place, York, decorative country furniture, garden and architectural pieces, DJ Green Antiques, Sheffield, French and English decorative antiques for the home and garden, and Chris Holmes Decorative Antiques, Harrogate, rustic and decorative antiques for the home and garden, showing with Chloe Holt who will bring her original contemporary oils framed in antique frames. Other art dealers at the fair include Granta Fine Art with C20th Modern and Contemporary Art, Larkhall Fine Art with 19th and 20th century master prints by artists from around the world. 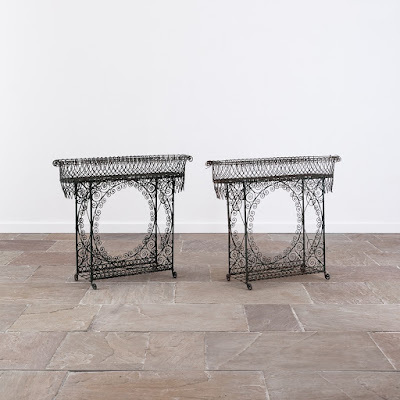 Nordic contemporary design will be well represented by Swedish by Design, Dorset and Nordic period painted furniture from The Swedish Room, Hungerford. La Place Antiques, Arundel, West Sussex will show English and Continental painted furniture, lighting and antiques. Tetbury based Jacqueline Hall will return with a mix of French and English decorative furniture. 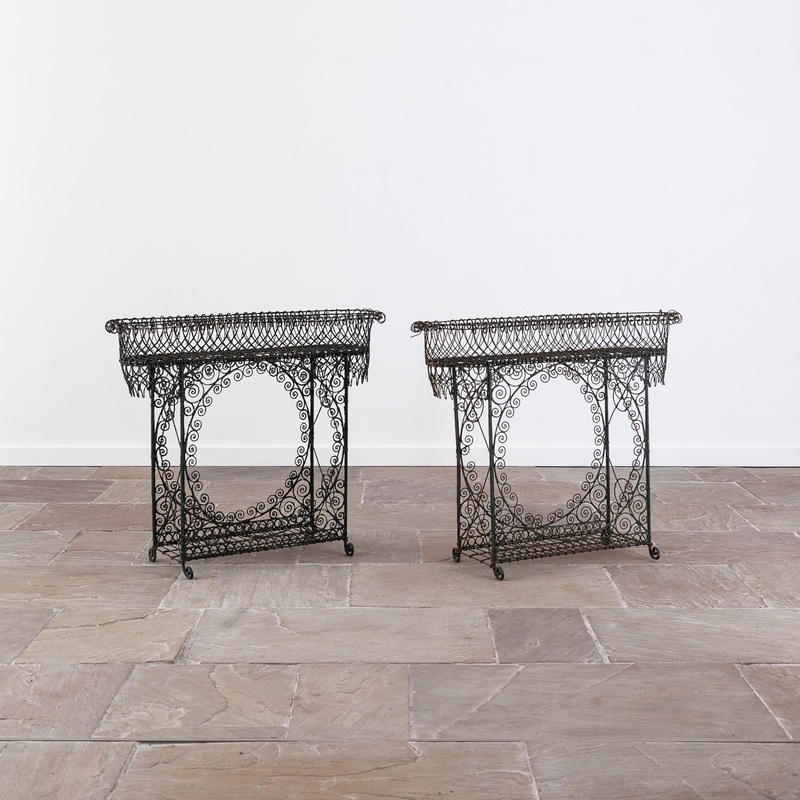 Wharton Antiques, Somerset, will bring a mixture of architectural elements, fire surrounds, decorative accessories and decorative accessories for home and garden. Emily’s House, Tetbury, deals in Berber, Turkish nomads – and handmade Kilims, vintage Beni Ouarain and Moroccan rugs and will show how to use these period rugs and textiles in the modern interior. Don't forget to claim your complimentary ticket on the Bath Decorative Antiques Fair website where you'll also be entered into two competitions to win a year's Homes and Antiques magazine subscription and a night stay at The Gainsborough Spa Hotel! 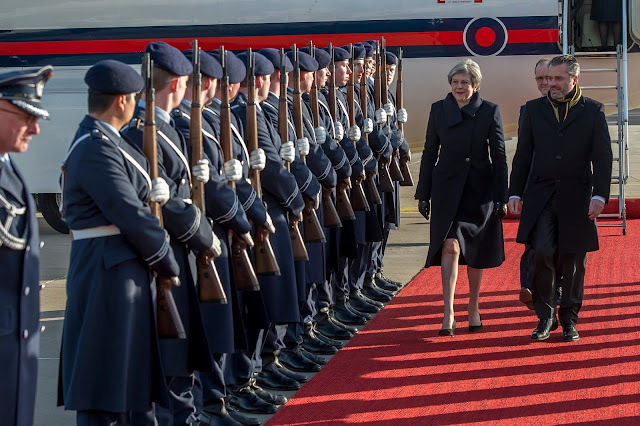 The PM was in Germany this weekend for the Munich Security Conference. 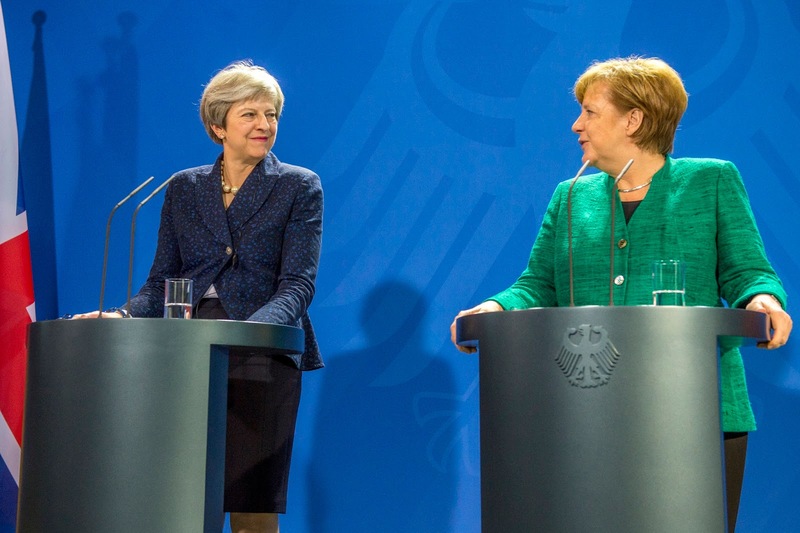 Arriving in Berlin ahead of the Conference, Theresa May held talks with Chancellor Angela Merkel and a press conference. May flew the flag for Britain, wearing the navy Notch Military jacket from Daniel Blake, navy skirt and the Twiggy kitten heels from Russell & Bromley. May also wore the Military coat from Daniel Blake. 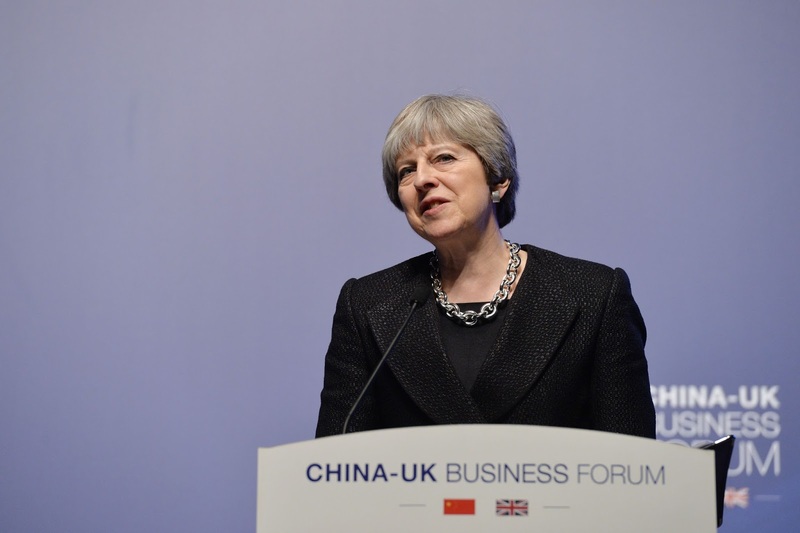 On Saturday, the PM addressed the Munich Security Conference. Wearing a black Military tail coat from Daniel Blake, Theresa May talked about the key security issues facing the UK and the EU. May also wore the Charlize silver toed loafers from Russell & Bromley. It's been ten years since Charlotte Olympia captured us all with whimsical shoes and accessories. From surrealist platforms to the iconic Kitty flat, Charlotte Dellal's range of quirky footwear is a firm favourite of fashionistas up and down the land - including the Prime Minister. We're all well versed in Theresa May's love of shoes, particularly those from high street favourite LK Bennett and Russell & Bromley. Adding a new designer to the mix, May's first pair of Charlotte Olympia's were donned for a good cause. 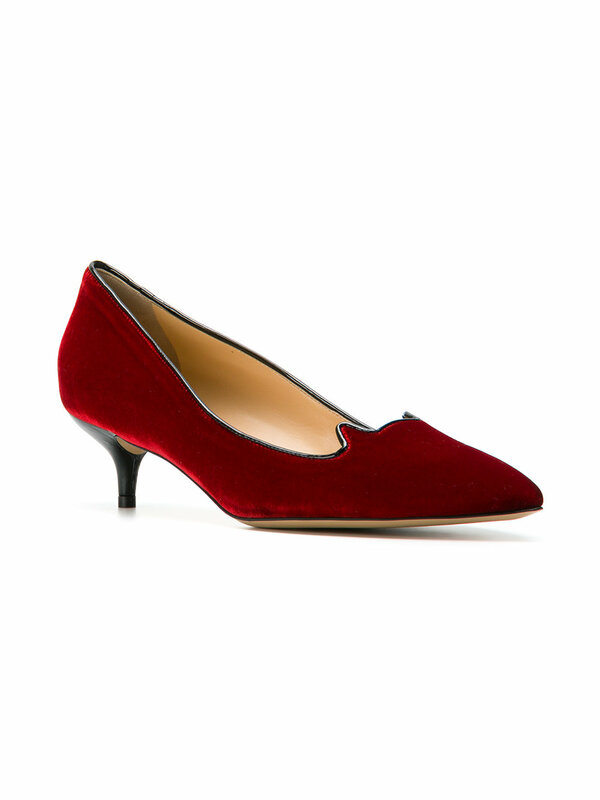 Supporting 2017's Red Nose Day, Theresa proudly wore a pair of deep red velvet Kitty kitten heels especially designed for her by Dellal. 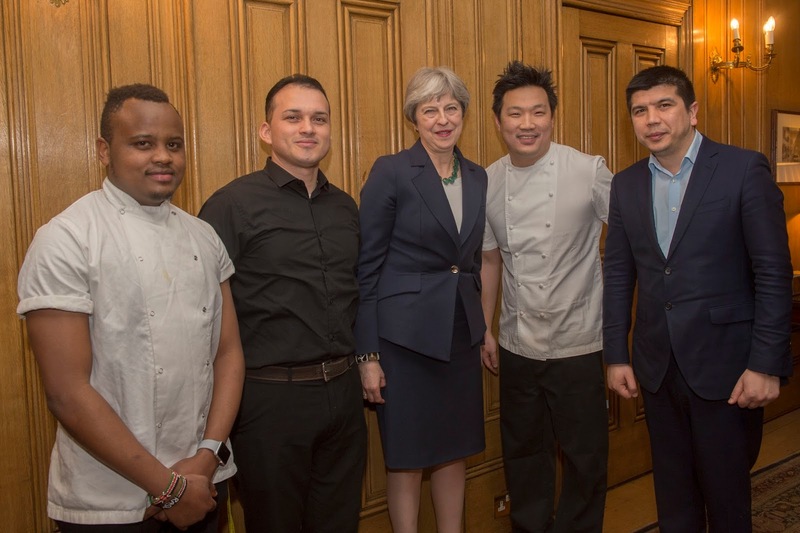 Teaming them with a red jersey dress and cashmere camel blazer from MaxMara for constituency business, the shoes were auctioned, with the proceeds donated to the charity. 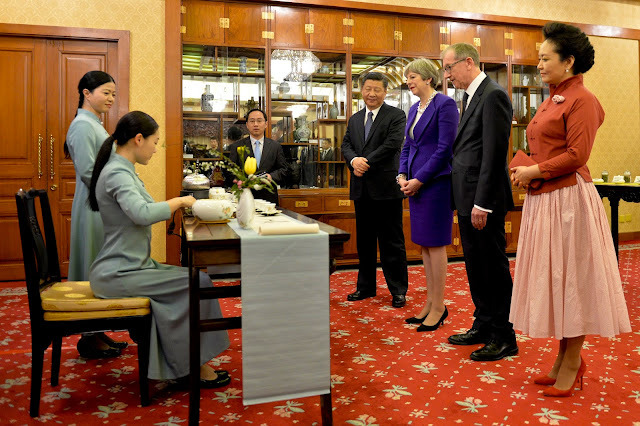 Whilst it is a secret where those kitten shoes ended up, it's no surprise that Charlotte Olympia's beautiful craftmanship, comfort and design details impressed the PM. 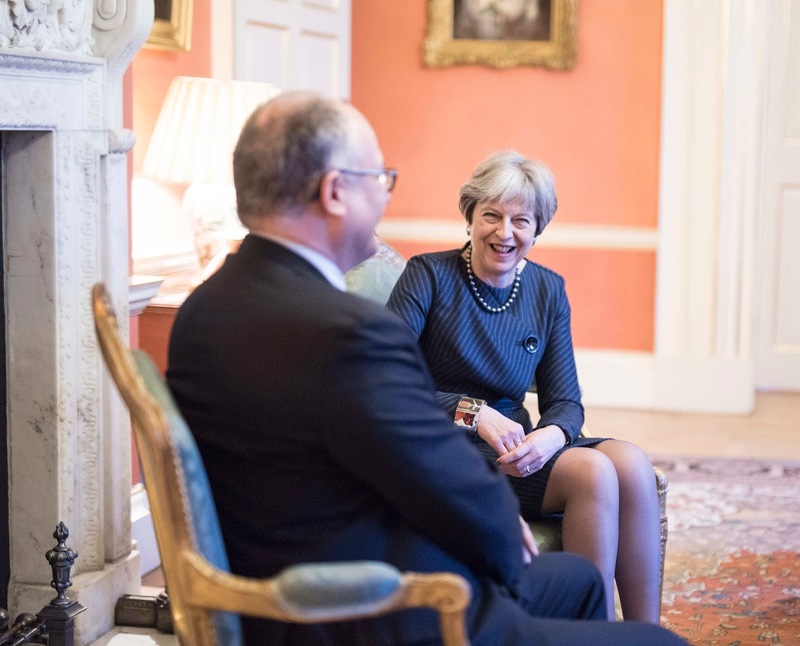 Fast forward to June 2017 and a very similar pair of Kitty heels were debuted by the Prime Minister on a visit to the European Commission in Brussels. 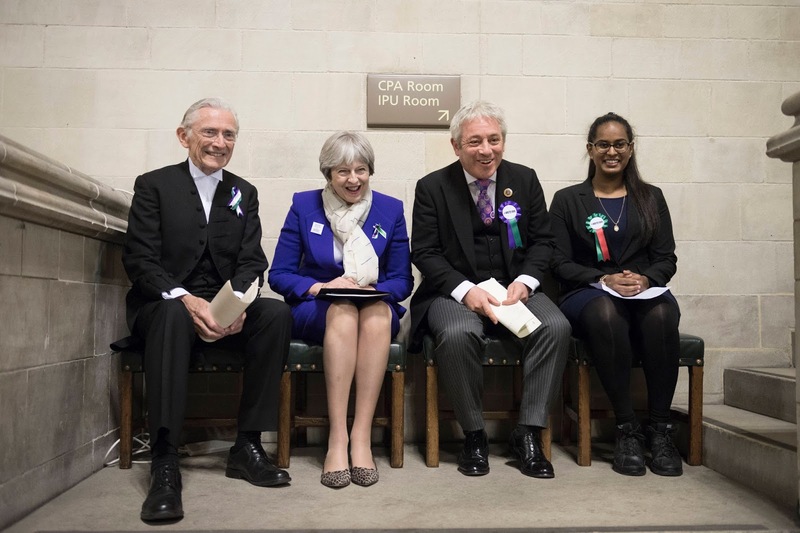 Accessorising a navy and pale blue shift and coat by Amanda Wakeley, Theresa May rocked the velvet leopard shoes in true fashionista style. The little tip ears were the giveaway, and many of my lovely readers were as excited as I was to see May wear these fabulous kitten heels. 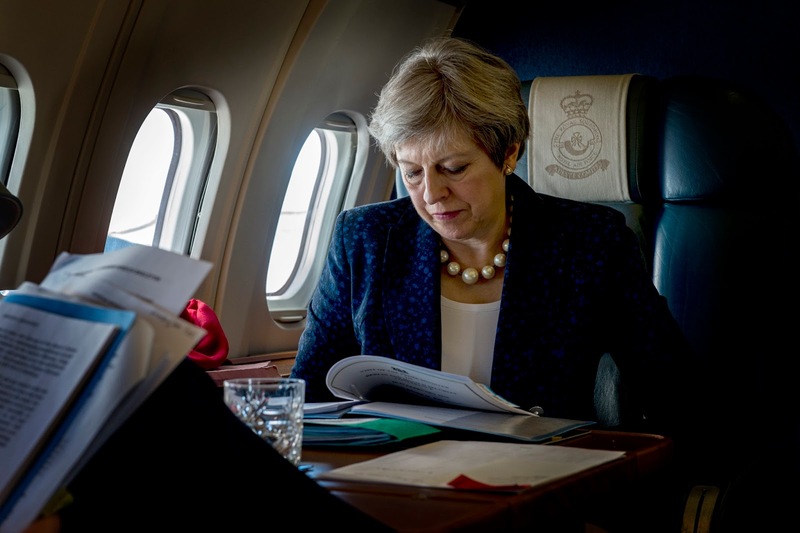 The PM has worn these pretty frequently over the past several months. They popped up with the gorgeous blue Daniel Blake Orchid jacket at the G20 in Hamberg. 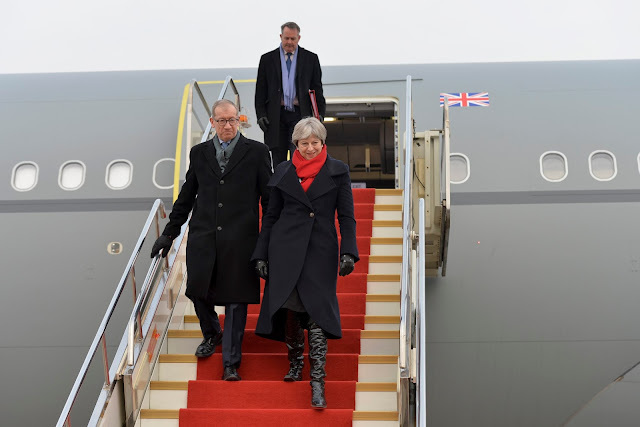 They added a touch of fierce to the Florence speech outfit and looked chic with trousers and May's Herno coat when President Macron came to visit. 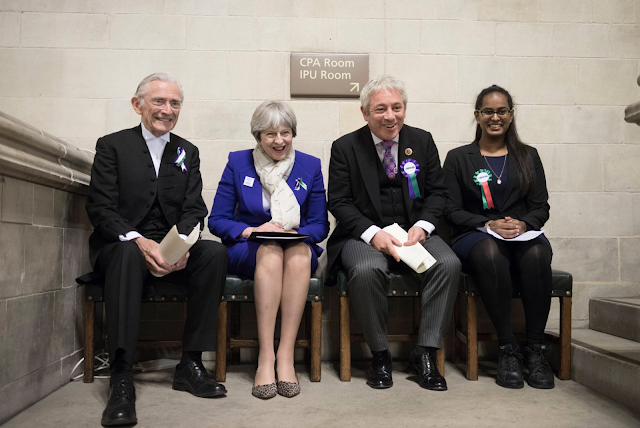 They have made many appearances at the despatch box - and most recently, at last week's Representation of the People Act commemorations. Perhaps it is safe to say that these are at the top of May's most favoured new purchase list? 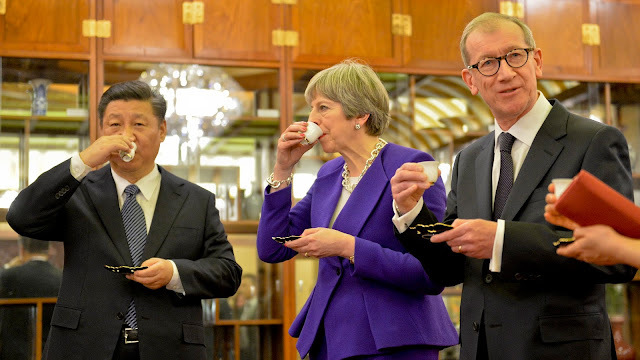 Who could blame her! You'll have to act quick to snag a leopard pair, and the red ones are now available to purchase- perhaps the PM will add these to her wardrobe? This week marked the centenary of the Representation of the People Act, with the Prime Minister delivering a speech in Manchester and taking part in celebrations in Westminster. 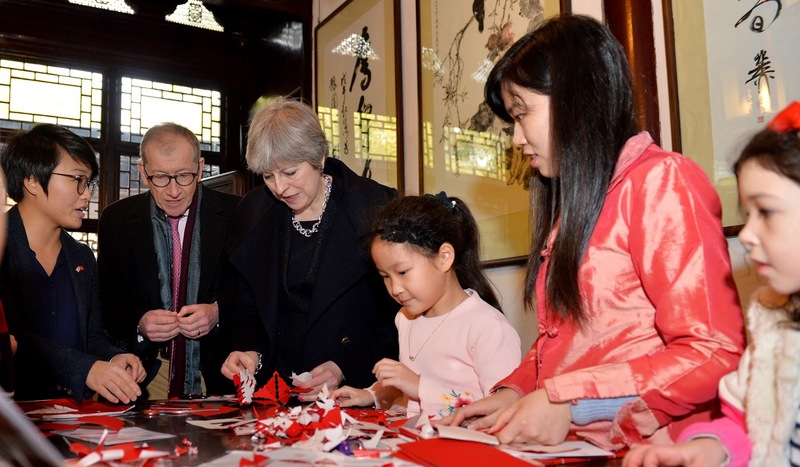 For the special day, Theresa May wore her fabulous purple Daniel Blake Origami jacket with matching skirt. She teamed it with the Charlotte Olympia leopard Kitty heels and keeping warm against the freezing winter temperatures, wore her navy Herno coat and red scarf. 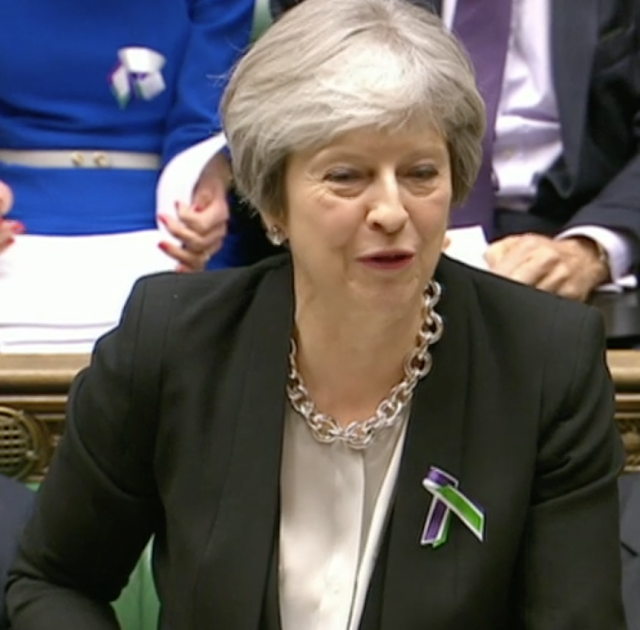 On Wednesday, the PM took part in the weekly Prime Minister's Questions, selecting a black trouser suit and ivory top for her appearance at the despatch box. 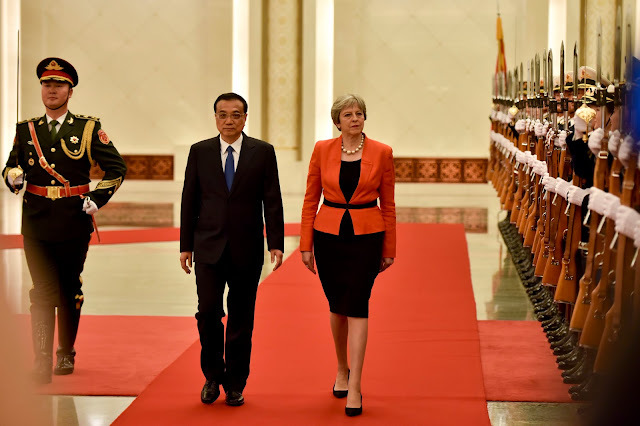 May accessorised with the oversized Amanda Wakeley chain set and a pair of black ankle boots. 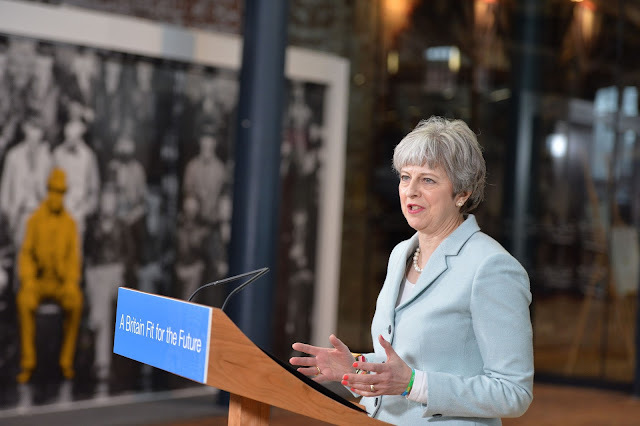 In the evening, May attended the Conservatives Black and White Party at the Natural History Museum. She wore her black lace jumpsuit and a pair of red patent heels from LK Bennett. 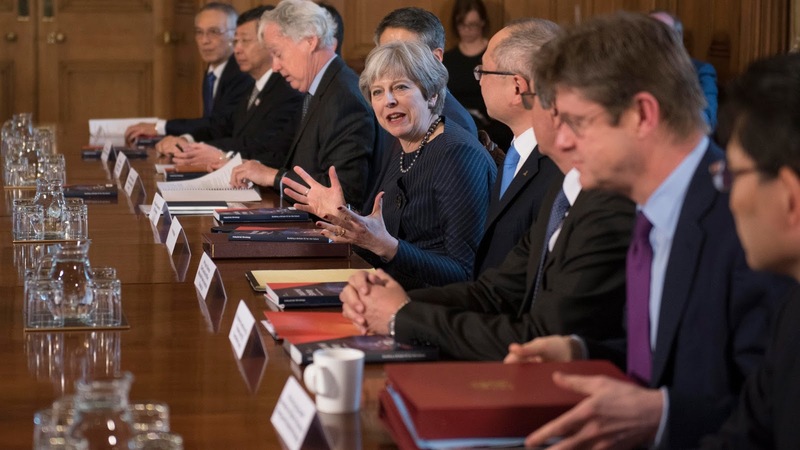 On Thursday, the Prime Minister welcome Japanese investors to Number 10 for a Brexit roundtable meeting. 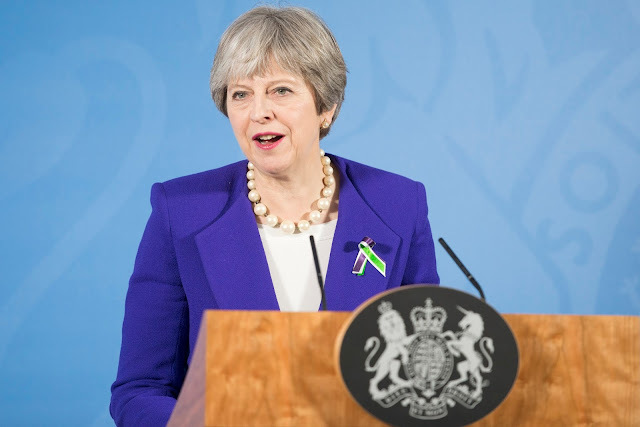 May wore the asymmetrical grey striped with button detail by Daniel Blake. She kept it classic with a string of grey pearls and her Celtic Treasure ring. May later met with Roberto Gualtieri MEP. And May also recorded a fun interview with Nikki Lilly! We find out about her first fashion faux pas and how she deals with negativity. 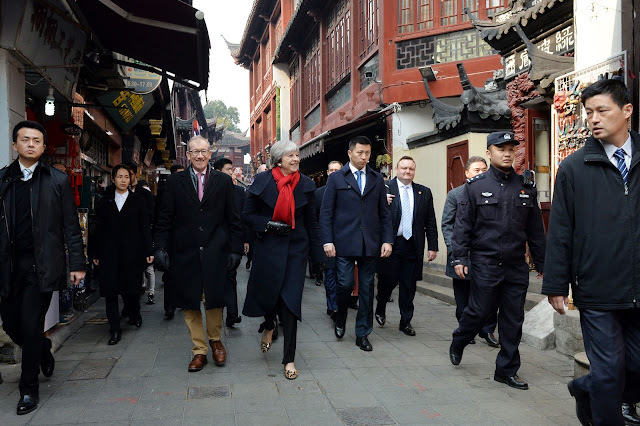 Theresa May took her first trip as Prime Minister to China this week. In a whirlwind three days, the PM visited Wuhan, Beijing and Shanghai, securing trade between the UK and China and many more cultural commitments. Accompanied by Mr May, the PM left London on Tuesday, arriving in Wuhan on Wednesday. Keeping warm against the chilly climes, May kept warm in her navy Daniel Blake military inspired coat, a red scarf and the over the knee croc patent boots from Russell & Bromley. 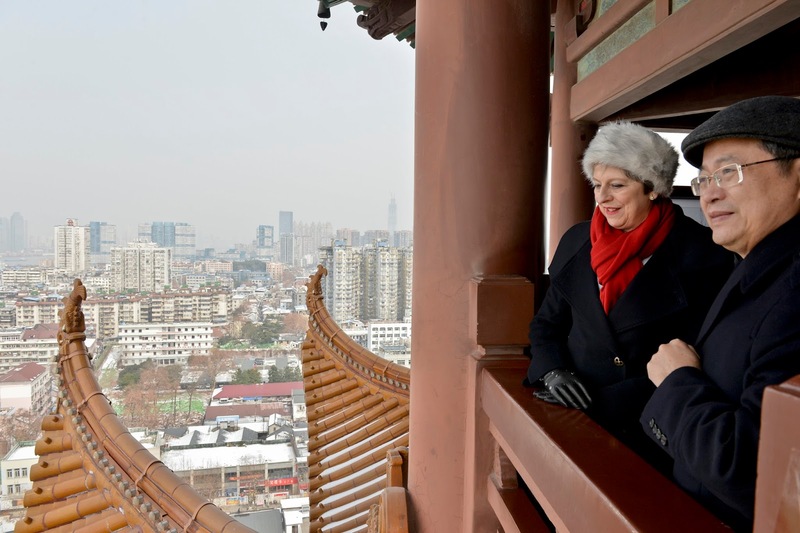 The PM's first stop was the Yellow Crane Tower where she and Mr May watched a performance of Chinese opera. We love her new fur hat! 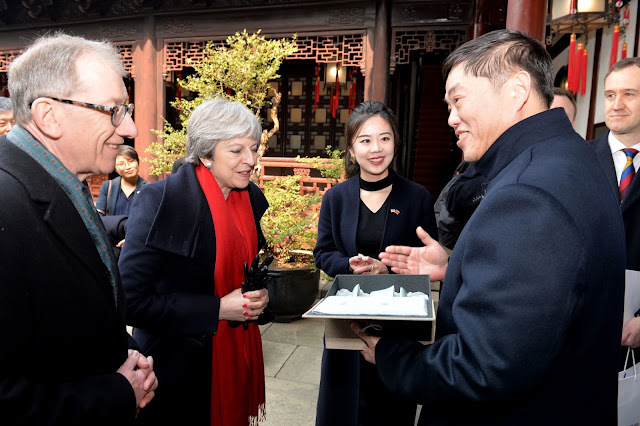 The PM then made a visit to the Yangtze River before visiting Wuhan University. The PM's outfit was her light blue blazer, teamed with a navy skirt and oversized pearls. 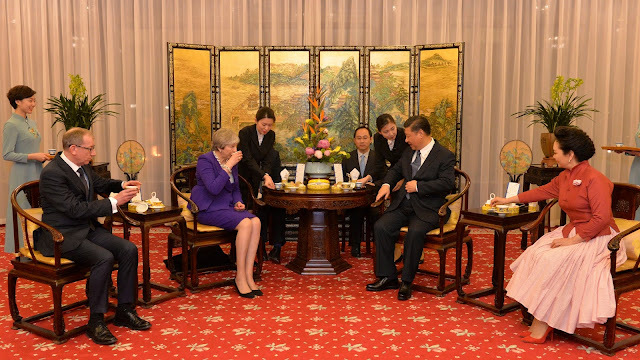 The PM also met with Premier Keqiang in the Great Hall of the People as part of the UK-China CEO Council. May wore her red Amanda Wakeley blazer, teaming it with a black cami, black skirt and the Twiggy kitten heels from Russell & Bromley. On Thursday, the PM took part in the traditional Eyes of Tiger ceremony, dotting the eyes of two tigers. 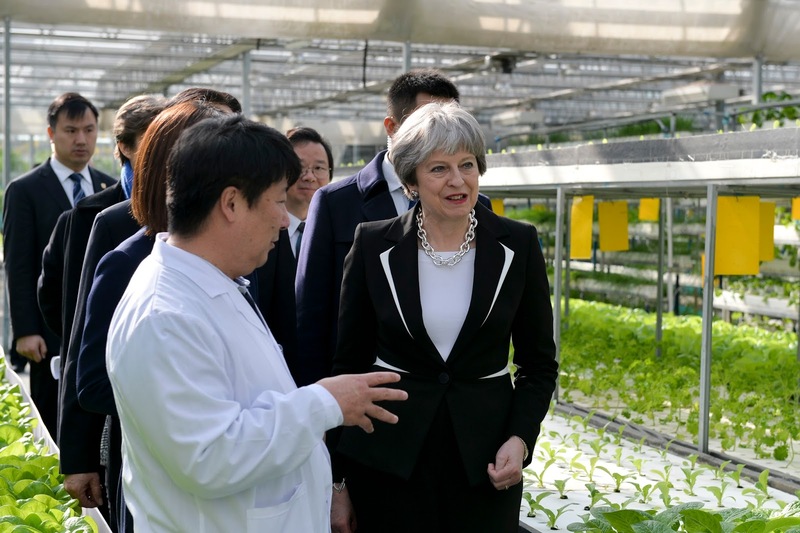 Later in the day, she visited the Agrigarden Research Centre. For these two visits May wore her black and white Escada blazer with black trousers and the Divine flats from Russell & Bromley. 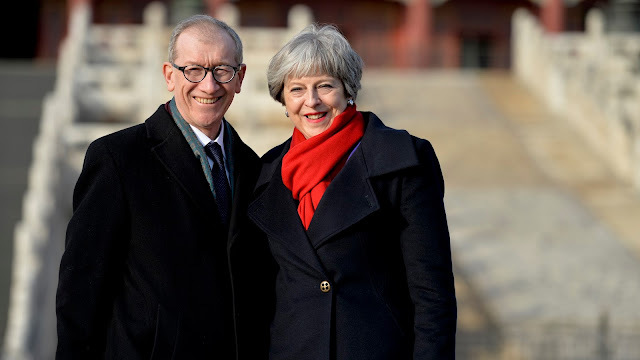 Later in the day, the delegation travelled to Beijing and visited the Forbidden City before meeting with President Xi Jinping. Arriving at the Diaoyutai State Guest House, the Mays participated in a traditional tea ceremony before meetings. 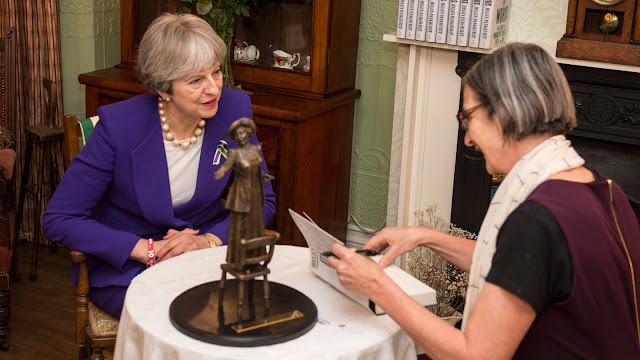 The PM wore her fabulous purple Origami jacket with matching skirt by Daniel Blake, teaming it with the Amanda Wakeley chain necklace and bracelet and the Twiggy kitten heels. 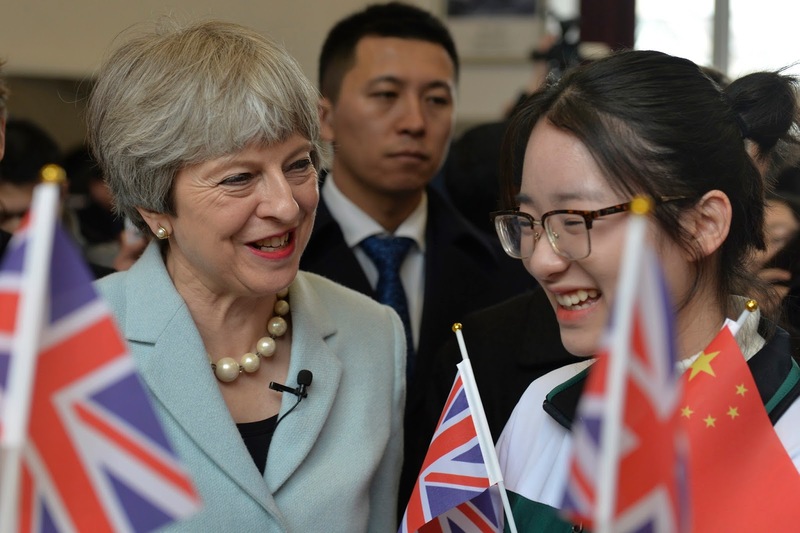 On Friday, May participated in the China-UK Business Forum before visiting the Yu Yuan Temple Garden and students in Shangahi. 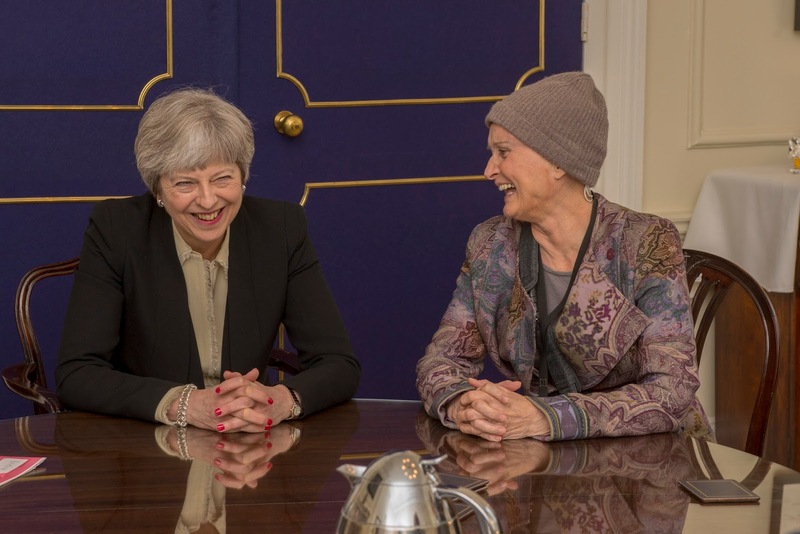 It was back to Daniel Blake for Theresa- selecting the Origami jacket in a slate sequins fabric, black trousers and the military coat. May teamed this outfit with her red scarf and the leopard Frame flats from Russell & Bromley. 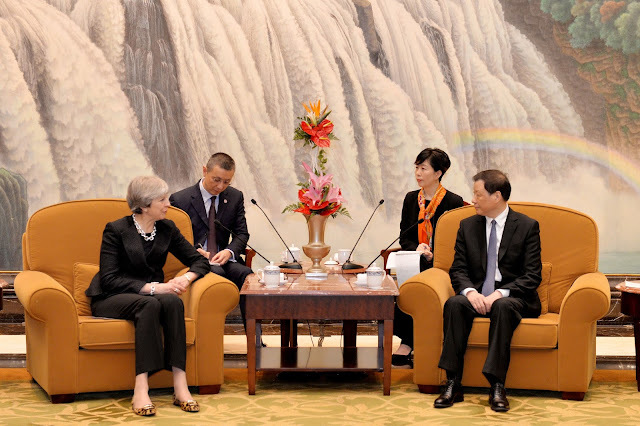 All in all, it was a best of British wardrobe for Theresa May's trip to China. 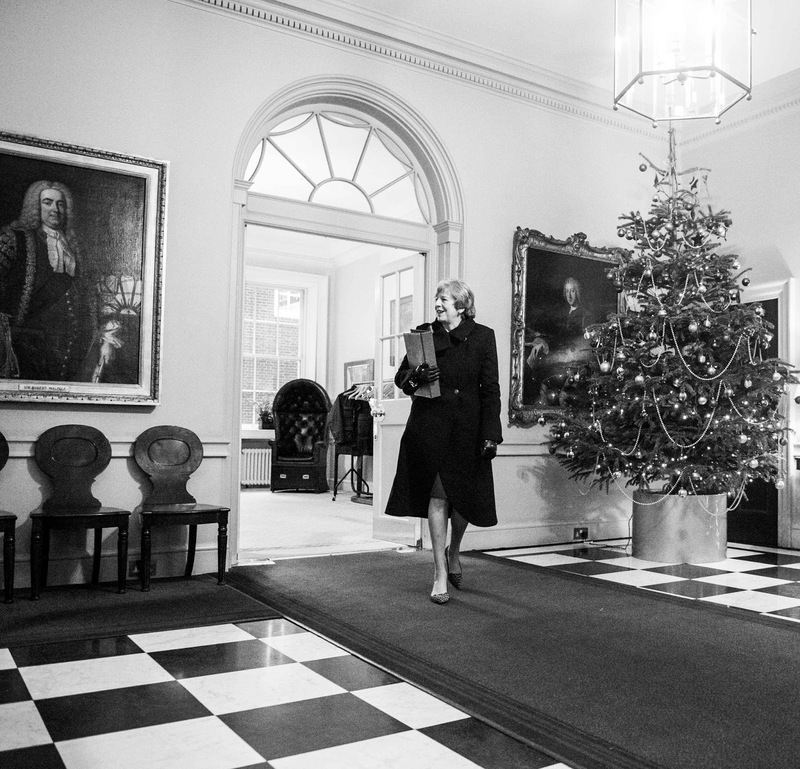 Spotlighting our great designer and high street talent, the Prime Minister is truly a champion of British fashion.